Check out the photos of Gwen Stefani from the 2015 Rock In Rio USA Festival in Las Vegas, Nevada. 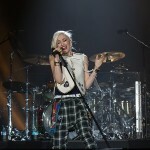 Dressed in a pair of plaid pants, white vest and her platinum blonde hair with black tips, the pop star preformed at the Vegas festival where she wowed the crowed with all members of her 80’s pop band No Doubt. Excited to be preforming for the Vegas party goers late into the night Gwen told the crowd she wanted to see “every single f—ing person in here jumping with me,”. By the looks of the photos Gwen was surely a showstopper! Check out the photos from the Rock stars performance below.